With reviews like that, and sharing double billing with the hit BONNIE AND CLYDE, BULLITT devastated audiences with incredible scenes of leaping, screaming automobiles that seemed to fly off the screen. Among all of Hollywood's road movies, BULLITT unquestionably made film history with its original car chase sequences. 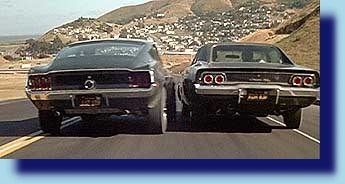 There may have been chase scenes before, but nothing before or since has equalled the intensity and impact of BULLITT. The scenes, which were novelty then but classic now, were brilliantly executed. Over the years, fans have asked questions about the two cars used in the movie, a 1968 Dodge Charger and a 1968 Mustang GT. Of all the musclecars offered in the late sixties, why were these two cars chosen, and how were they modified to survive the torturous driving? Before the filming could be done, the Charger and the Mustang required preparation. One of the best wrenchmen in the movie business, Max Balchowsky, recalls the Mustang in particular needed considerable modifications so it could hold up during the relentless beatings it would take during the filming. "Carey said they were gonna do a lot of jumping with it, and he said it had to be strong. So I was a little hesitant. I didn't know if they wanted to go over 50 foot cliffs. I had no idea what they wanted to do until I got there." To beef up the Mustang, Balchowsky started with the suspension, reinforcing the shock towers, adding crossmembers and reinforcements, exchanging the springs for replacements with higher deflection rates and replacing the stock shocks with Konis. All suspension parts were magnafluxed and replaced where nescessary. The engine also came in for some modifications, including milling the heads, adding an aftermarket high performance ignition system and reworking the the carburetor and adding headers. On the Mustang, Mr. Balchowsky recalls, "everybody suggested I put a Holley on the Mustang, it was better than the Ford carburetor. I've always had good luck with Fords, and didn't want to spend money if i didn't have to putting a Holley on. It ran good, needed just a few little adjustments. I changed the distributor and all, but basically never had the engine apart on the Ford." Ron Riner remembers "the stock Mustang had undercarriage modifications, not only for the movie, but for Steve McQueen. Steve liked the sound of the car and he wanted mags. We hopped it up because Steve wanted the car hopped up. He was still a kid." "I'll tell you this," said Max Balchowsky, "I was really impressed with the Mustang after I got done with it. I didn't think it'd make that much difference beefing it up. Later, we took both cars out and went playing around with them over by Griffith Park (near Los Angeles). The Dodge, which was practically stock, just left the Mustang like you wouldn't believe." Ron Riner has similar recollections. "The Charger ran rings around the Mustang. We trimmed the tires down (on the Charger), we practically made them down to bicycle tires to try and handicap Hickman, and Bill just run them." Carey Loftin also recalls," we test ran the car at Griffith Park near the Observatory, up a long hill. and if you can run a car real hard up and down that hill it's working pretty good." Generally everyone seemed to agree that the chase went smoothly, although filming went a "little bit slow," Bud Elkins recalls. "Yates and Steve were particular. You would rehearse it once- it's got to be choreographed- then you would rehearse it again, and if it looked good, they shot it. You rehearsed at about 1/4 speed or 1/2 speed, then you went in to film it at full speed." For the in-car scenes, two camers were mounted in the cars and painted black. The jarring landings after the cars were airborne are the result of the cameras being tightly secured and not cushion mounted. The effect was more than McQueen had bargained for. "It's a funny thing," he told Motor Trend. "That was what shocked me and I didn't expect it, because we were using a 185 frame which is a very small frame. We weren't even using a big super Panavision or anything. Even on the 185, they (the audience) jumped out of their seats. I didn't do the shots going down the hill, they pulled me out of the car. Bud Elkins did that." In the Motor Trend interview, McQueen recalled there were some close calls and incidents that looked good on film but weren't exactly planned to happen, some of which occured in the memorable downhill sequences. "Remember that banging going down? That was about 100 mph. I was bangin' into Bill. My car was disintegrating. Like, the door handles came off, both the shocks in the front broke, the steering armature on the right front side broke and my slack was about a foot and a half. The Mustang was really just starting to fall apart." The gentleman in the car, playing Bill Hickman's partner in crime, was actor Paul Genge. According to Ron Riner, Mr. Genge, who played a very realistic tough guy, "seemed like he had hardly ever seen a gun before. They scared the hell out of him. In the scenes in the Charger with Hickman, he was scared to death. After two or three time we almost had to bodily put tranqiulizers in him, and put him in the car. Mr. Hickman was one of the coolest drivers I've ever met." Max Balchowsky tells us, "there was a scene where the Charger passed a truck, and they only wanted to leave so much room on one side, and Hickman did it perfectly when he came by and took the bumper off the truck. That was a super shot. Throughout the chase sequences, some of them were accidents but, they looked fantastic- Hickman was terrific." The enduring scenes of the forboding Charger and the powerful Mustang have etched themselves in film making history. The sequences were the brain child of Steve McQueen; He knew what he wanted and how he wanted it to appear on film. No one has duplicated the electricity or the savage ferocity that manifested itself in BULLITT chase scenes, and it's doubtful any one ever will.